This Tuesday, though, in a display of the sort of détente that might have spared Colonel Austin a few espionage missions, “The Six Million Dollar Man: The Complete Collection’’ arrives from Time Life. (The set is available exclusively online at www.6MDM.com, and is priced at $239.99.) The entire 100-episode run of the series is complemented by new interviews with Majors, costar Richard Anderson (Oscar Goldman), and “The Bionic Woman’’ star Lindsay Wagner. Featurettes include a segment on those famed cranking-electronics sound effects — supposedly created by a vibrating metal ruler — and another on the show’s toy merchandising. (Remember the Steve Austin bionic-eye action figure that Steve Carell reluctantly lists on eBay in “The 40-Year-Old Virgin’’? It wasn’t just a prop.) Several discs of pilot and reunion movies offer curiosities like Darren McGavin’s initial casting as Steve Austin’s handler, and a pre-“Speed’’ Sandra Bullock as a new bionic heroine. Viewed now through the prism of “Lost,’’ “Alias,’’ and “The X-Files,’’ “Six Mil’’ (as insiders call it) also flashes glimpses of the sort of trippy mythology we’ve come to expect from genre television. Nothing quite so labyrinthine, maybe, but it’s there. 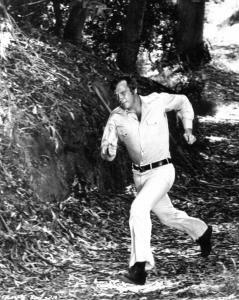 Secretive government plans to develop a seven million dollar man, Steve’s misgivings be damned. The bionics program’s equally hush-hush resuscitation of Steve’s fiancee, Jaime Sommers (Wagner), following her apparently fatal rejection of the technology. Aliens covertly embedded in the California wilderness for centuries, studying us. Those same aliens creating a robotic Bigfoot (actually pro wrestler André the Giant) as part of their cover. At times, though, the stunt-loving Majors played him a bit too straight-up heroic for Anderson’s liking. “I had my hands full with that guy,’’ says the veteran character actor, who holds the unusual distinction of having played the same role on two different networks simultaneously, after “The Bionic Woman’’ moved from ABC to NBC for its final season. “I remember one shoot where Lee took off hanging from a helicopter for 10 minutes — not that he had 10 minutes of stuff to do. I went up to him afterward and said, ‘Are you trying to shut us down?’ But that was Lee. He really loved all of that. The part was perfect for him.’’ Insert bionic sound effect here.